✔ COMFORTABLE & WARM: Soft and warm lining design,It's great not having ice cold fingers while texting/typing/writing in cold winter. ✔ TOUCH SENSITIVE & ANTI-SLIP PALM: The Unique and Practical 3 Touchscreen Fingers Capability design(thumb, forefinger ,middle finger), you can use the gloves on all your touch screen devices. The gloves work just like using your fingers. Palm large area triangle silicone non-slip design for driving & phone grip maintain dexterity. 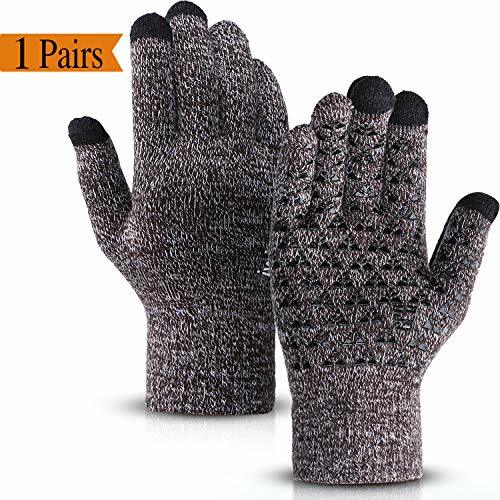 ✔ PERFECTLY FITS & BEST GIFTS: This is a high-quality couple gloves, has excellent elasticity, Stretches to fit most hands, You can easily get a custom fit according to your hands. it is best appropriate gift for your lover friends and family etc. 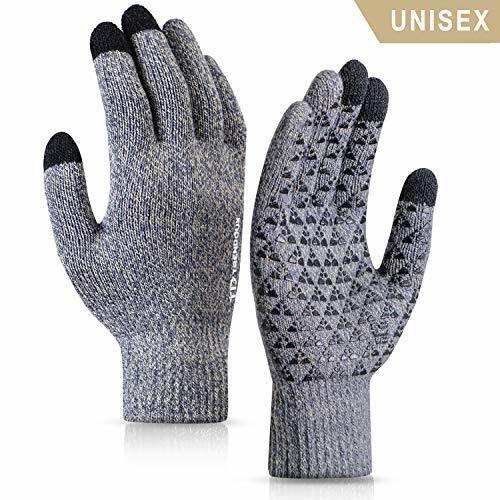 ✔ CONVENIENT & BREATHABLE MATERIAL: Living in the technology age, gloves that allow you to utilize your devices without removing them is essential.Breathable material make sure your hands do no sweat while wearing the gloves. ✔ 100% MONEY BACK GUARANTEE: Contact us if you are not satisfied with it. We'll process full refund or send you a replacement without returning or any additional conditions. All issues will be solved within 24 hours. ✔ COMFORTABLE & WARM:soft and warm wool lining design,It's great not having ice cold fingers while texting/typing/writing in cold winter. ✔ TOUCH SENSITIVE & ANTI-SLIP PALM:The Unique and Practical 3 Touchscreen Fingers Capability design(thumb, forefinger ,middle finger),you can use the gloves on all your touch screen devices.The gloves work just like using your fingers.Palm large area triangle silicone non-slip design for driving & phone grip maintain dexterity. 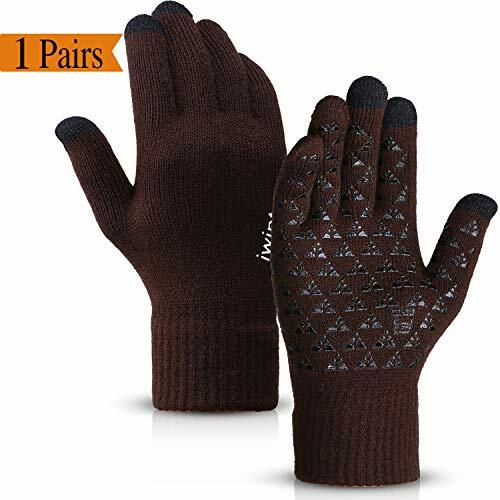 ✔ PERFECTLY FITS & BEST GIFTS:This is a high-quality couple gloves, has excellent elasticity, Stretches to fit most hands, You can easily get a custom fit according to your hands. it is best appropriate gift for your lover friends and family etc. ✔ 100% MONEY BACK GUARANTEE:Contact us if you are not satisfied with it. We'll process full refund or send you a replacement without returning or any additional conditions. All issues will be solved within 24 hours. 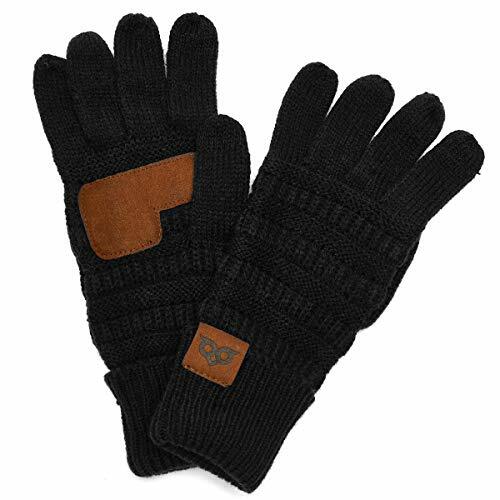 SOFT WARM MATERIAL - The womens winter gloves are made of wool, acrylic and lycra. Hand knitted, thick, comfortable and elastic fabric to keep you warm. Don't worry about the size, the ladies gloves are super soft, and stretchable, lightweight and versatile enough for any occasion. 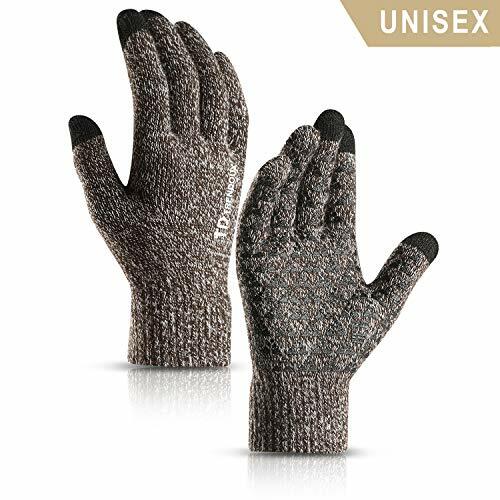 MULTIFUNCTIONAL DESIGN - The wool gloves, simple but upscale, make your hands warm while you're enjoying your time with your favorite touch screen device in cold weather. What's more, the knit wool gloves is DETACHABLE, which can be detached into 2 gloves, one full finger gloves and one fingerless gloves! One size fits most people. The full finger gloves length: 8.6in, the fingerless gloves length: 5.1in. 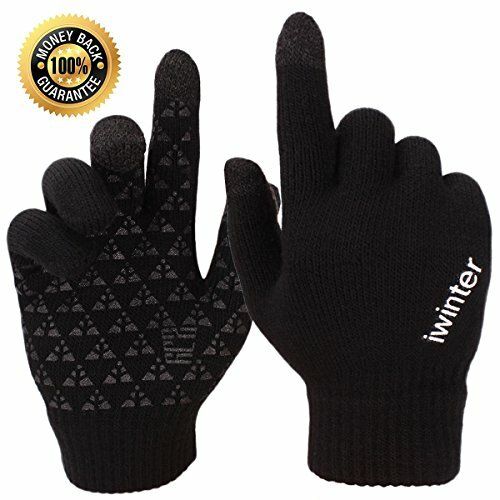 SENSITIVE TOUCH -The winter gloves is very comfortable to touch and wear. 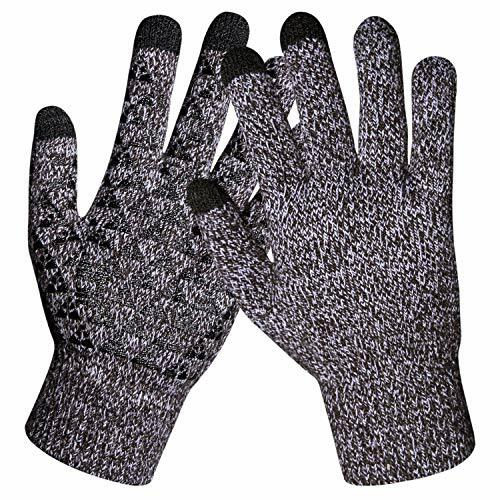 The touch screen gloves works just like using your fingers by practical 3 touchscreen fingers capability (thumb, forefinger ,middle finger). It's great not having ice cold fingers while texting/typing/writing in cold winter. 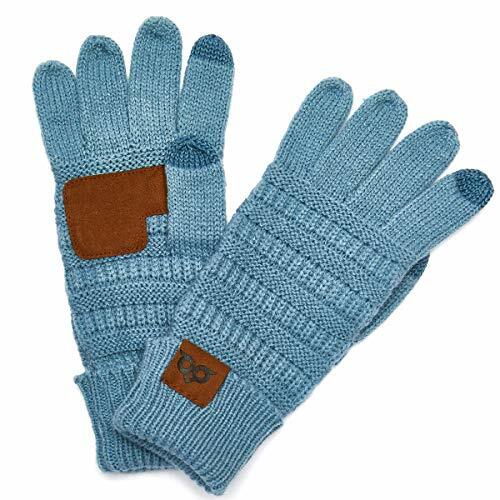 GREAT GIFT - The warm gloves will be a great gift for your lover, family, friends and so on. Get ready to give them a special gift and a surprise in this coming cold winter days. Various classic colors and stylish design, all go great with great looks. RISK FREE GUARANTEE - Quality guarantee and 5-star customer service. 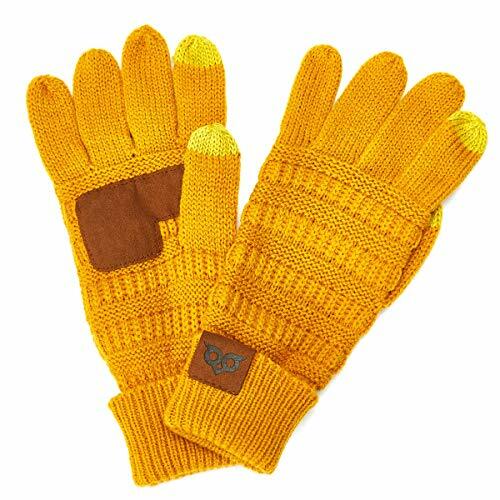 If you are not completely satisfied with your womens wool gloves simply let us know and we will do our best to solve your problem. 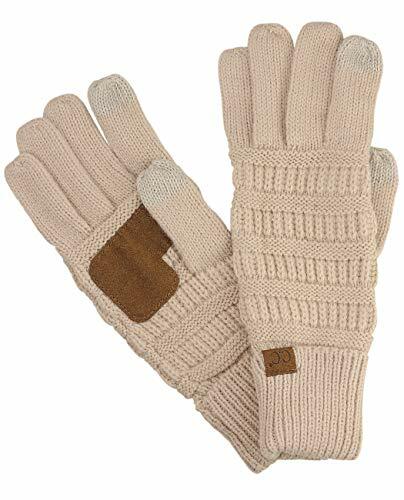 SENSITIVE TOUCH - The knit gloves works just like using your fingers by practical 3 touchscreen fingers capability (thumb, forefinger ,middle finger). you can use the smart gloves on all your touch screen devices. Fingertips with touch screen sensitivity provides much convenience to use your smart phone when you take outdoor exercises. The finger can operate the mobile phone without removing the gloves. 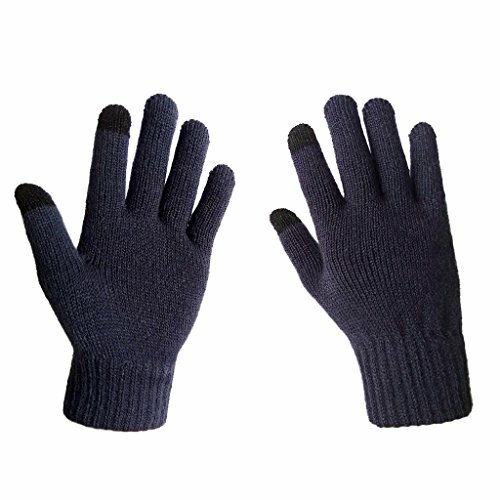 HIGH QUALITY - The winter warm gloves made of acrylic, polyester and spandex. Soft and fashion knit construction keeps you warm. It is very comfortable to touch and wear, durable and stretch well. MULTIPURPOSE GLOVES - The touchscreen gloves can also be used for cycling, biking, running, motorcycle, driving. Touch sensitive, anti slip, and flexible. The gloves work just like using your fingers. Palm large area triangle silicone non-slip design for driving and phone grip maintain dexterity. 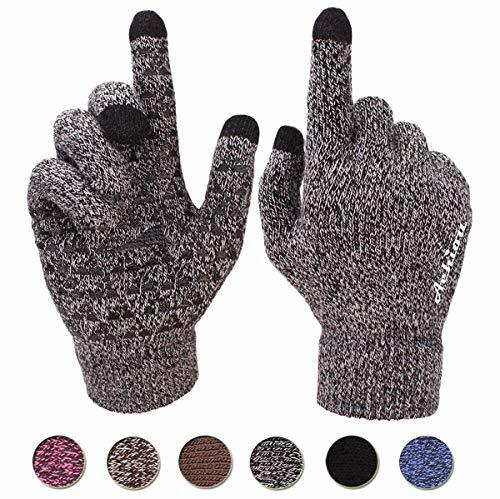 EXCELLENT VALUE - Wearing the texting gloves, you can touch screen of your smartphone or tablet without taking off mittens in the cold weather. 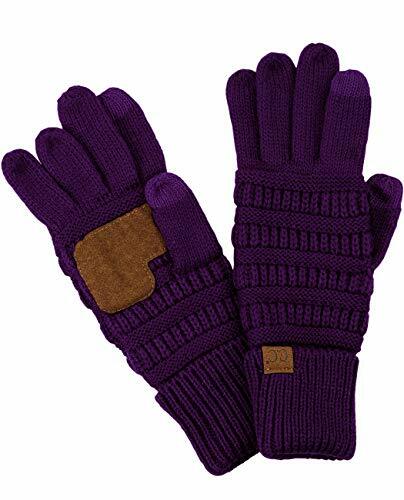 Unisex, the winter knit gloves are suitable for men and women. One Size: the circumference of the hand is about (7.08-7.87 inch). RISK FREE GUARANTEE - Quality guarantee and 5-star customer service. If you are not completely satisfied with your mittens gloves simply let us know and we will do our best to solve your problem. TOUCHSCREEN capable - In today's world, be it freezing winter or scorching summer, one thing you can not live without is your phone. 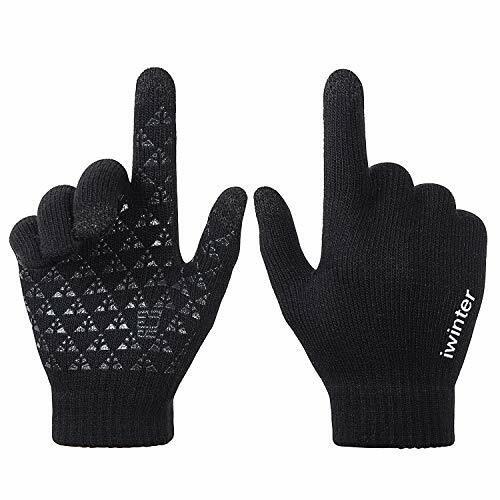 Our gloves addresses your winter problem through Touchscreen enabled for thumb and index fingers. IT allows you to allow you to conveniently use your cell phone or tablet without taking off your gloves for every action you want to take with your device. As long as you use thumb and forefinger, our gloves work just like using your fingers. 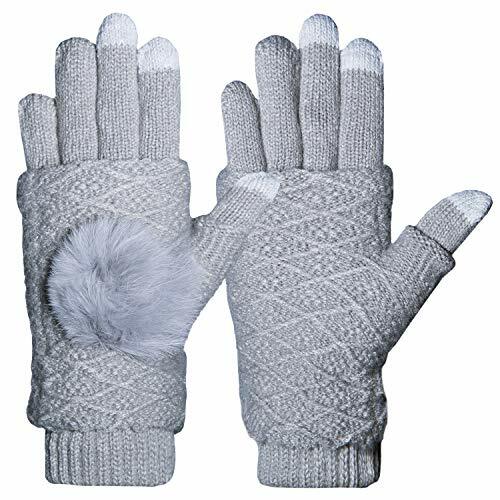 Comfortable and Warm - Features 100% high quality wool outershell plus fleece lining, the gloves are extremely comfortable and warm considering they aren't bulky! Also with the stretchy snug fit, you can type a text just as fast as you would without gloves. Unisex with size and color options - Fashionably designed to style for both men and women. Two color choices and two size options in M/L size. So on a winter trip we take care of your partner as well. 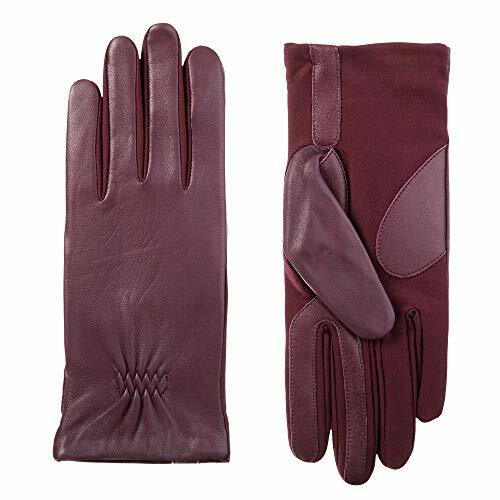 GIFT IDEA - This is a high-quality couple gloves, has excellent elasticity, Stretches to fit. If you are struggling with a gift idea to a loved one or a casual friend, , this is a gift idea with universal choice and usability. SHOP WITH CONFIDENCE - Pun intended, we have cut no corner in our product and will cut no corners in providing after sales service. If you are not happy with your purchase for any reason, please do contact us within 7 days for free replacement or refund with no questions asked. The shopping cart is already added with our commitment, it just needs your order to commence the journey. Classic design and fit: Genuine stretch leather texting gloves blended with spandex for a high-end timeless style and the perfect contour fit. Stay warm: Stretchy soft fleece lining provides a contoured fit with a layer of silky softness for a custom fit for the perfect balance of warmth, style and comfort. Stay connected: Equipped with smarTouch touchscreen technology in thumbs and index fingers enables smart phone and tablet use allowing you to tap and swipe with precision and ease while keeping hands warm in the cold weather. No glove is more accurate and compatible while using an iphone, ipad, kindle, tablets, android, Galaxy, Note and all mobile devices. Stay stylish: Palm strips for extra grip; Super sleek and classically styled available in fun prints and colors- perfect for work or a night on the town. Finger Tuchscreen and Palm Slip: Unique and practical nano 3 touch screen finger function design (thumb, index finger, middle finger), all touch screen devices with gloves can be used. Non-slip gloves work like fingers. The large-area silicone non-slip design on the palm is suitable for driving and mobile phone holding, maintaining flexibility and stability. 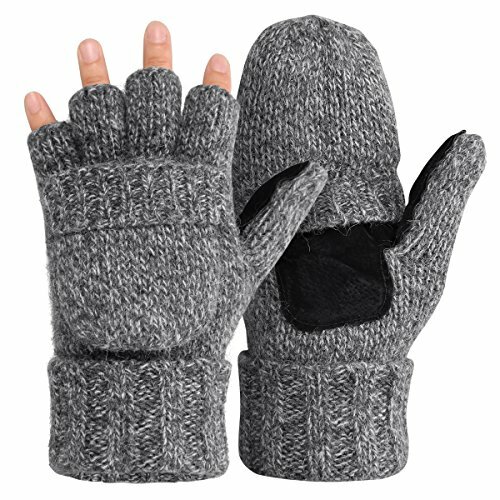 Comfort And Warmth: soft and warm wool lining design, texting, typing, writing, driving, cold fingers, cold fingers, outdoor ice skating, skiing and other activities. Moisture Wicking Function: Moisture wicking function allows you to sweat without sweating during exercise or use of the device. Living in the electronic age, gloves allow you to use your device without removing them is essential. 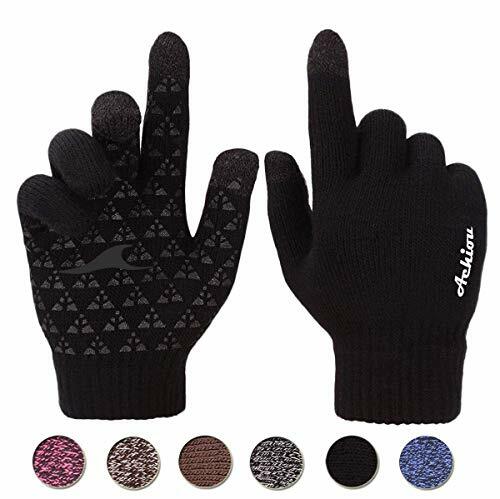 Perfect Fit And Best Gift: This is a high-quality couple's glove with excellent elasticity, suitable for most hand stretching, you can easily customize according to the size of your hands and the picture. This is the best Christmas and gift for your lover, family and family. 100% Money Back Guarantee: If you are not satisfied with this, please contact us by email. We will process a full refund or send you a replacement without return or any other conditions. All issues will be resolved within 24 hours. IMPORTANT NOTE and TIP - Please NOTE that Wearing this pair of gloves, Please be sure to wear to the top of each finger, especially the 2 touchscreen fingers, must be filled with our fingers, so that this touchscreen function will be effective, Otherwise it will be ineffective. Please Try to wear this gloves in the right way, or the Touchscreen function can be normal. 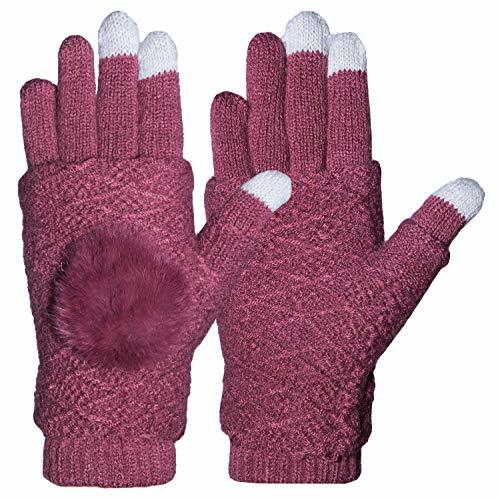 LETHMIK Women's Solid Magic Knit Gloves Winter Wool Lined with Touchscreen Fingers; Item Weight:0.11 LB , very soft and comfortable winter warm knit gloves, there are two Solid colors for you to choose. Hand Wash or Spot Clean Recommended! Please Try Not to Machine Wash or Brush Wash (In order to avoid Pilling). The Unique and Practical 2 Touchscreen Fingers Capability design, very Convenient and Great for Texting/Typing/Writing in cold winter; Comfortable and high quality Magic gloves material with excellent elasticity, Stretches to fit most hands, You can easily get a custom fit according to your hands. Pair off with your favorite Outfit. SOLID COLOR AND WARM WOOL LINED - The Classic Plain color Knitted, Build a simple and stylish Knit Construction style, super soft and warm wool lining design, it will be very suitable for Fall and cold Winter, provides you with Warmth, Comfort and Softness. It's an excellent choice for Gifts or Your Own Dressing. Buy more for your friends and family. √ MATERIAL --- Shell:100% PU Leather; Palm:100% warp-kniteed velvet. √ STRETCHY SIZE --- Length 9.6〃; Palm width 3.7〃. One size fits all & Suitable for American customers. √ SMART TOUCHSCREEN --- Precision touch point control, screens respond to all activity while wearing the gloves. All fingers work on all touch screen type devices. √ FLEECE LINING --- Warm and soft lining to keep your hands warm even in the low temperature, wind resistant for winter outdoor sports. Much warmer than 95% gloves in cold-weather. √ 5 CLASSIC COLORS --- Navy Blue, Gray, Red, Black and Coffee. Keep your hands warm when you're driving, running, biking, hiking, etc., yet thin to tuck in your coat pocket or purse with no problems. HERITAGE DESIGN: Classic soft Microsuede texting gloves with warm plush lining are the ultimate in cozy functional comfort. SherpaSoft lining is stretchy for a contoured fit and supremely soft for the perfect balance of warmth; style and comfort. STAY DRY: Made with smartdri technology that keeps you outside longer allowing water roll to right off your hand keeping you protected from cold rain and snowy elements. STAY CONNECTED: Equipped with smarTouch touchscreen technology in thumbs and index fingers enables smart phone and tablet use allowing you to tap and swipe with precision and ease while keeping hands warm in the cold weather. No glove is more accurate and compatible while using an iphone; ipad; kindle; tablets; android; Galaxy; Note and all mobile devices. CARE INSTRUCTIONS: Hand wash cool no bleach. Air dry flat. Do not tumble dry iron or dry clean. Suitable for any occasion,eg: outdoor,office,college, ice skiing,walking the dog ,jogging,ect. SOFT AND THICK FLEECED LINER: With an inner layer of fleece, your hands will not feel the chill or the wind. 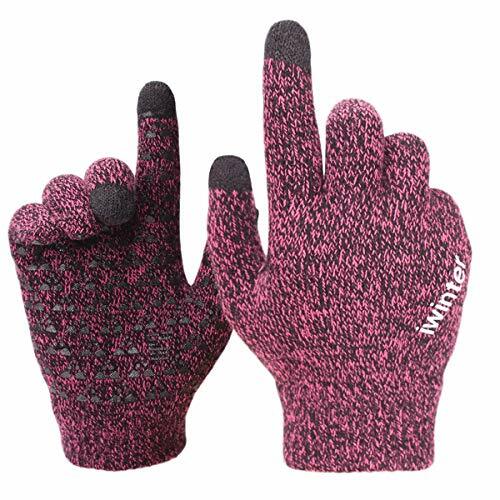 These winter womens gloves are soft,comfy and warm. But yet, our touch screen gloves are not bulky, allowing you freedom of movement. These women gloves are thick enough to keep your hands warm, yet thin to tuck in your coat pocket or purse with no problems. Perfect for the in-between stage of cold weather fall/winter. WINTER GLOVES WITH TOUCH SCREEN FINGERS: Equipped with touch screen technology to enable smartphone and tablet use while keeping hands warm in the cold weather. The touch screen parts are on the index fingers of both gloves and also the thumbs. They have a satin inset on the thumb and first finger to allow for use with a cell phone or touch screen device. 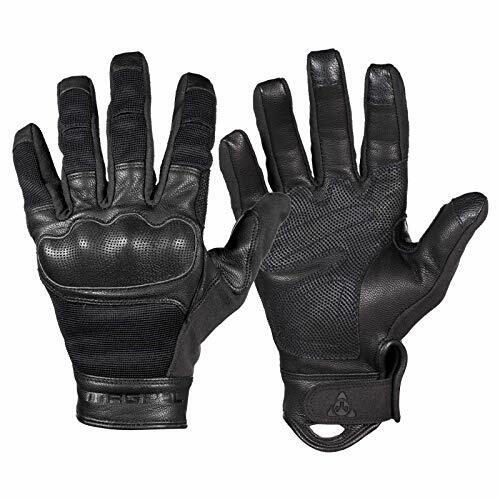 They are very versatile and work well as driving gloves and outdoors on the cellphone. CUTE AND WARM GLOVES FOR WOMEN: These are warm gloves with elegant appearance. 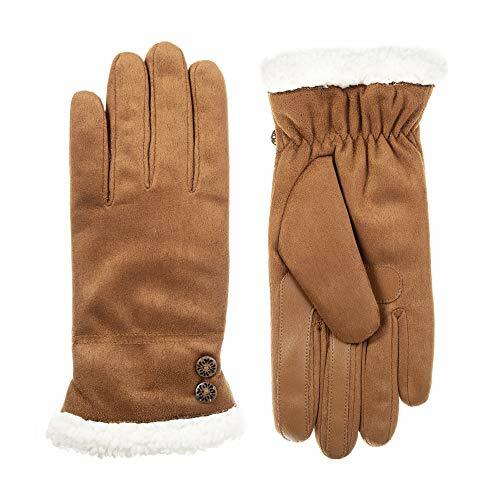 You will love the cute plush fur balls and accenting color on the wrist-gives the classic gloves a feminine touch. Adds great style and convenience with the screen touch to any cool weather outerwear. 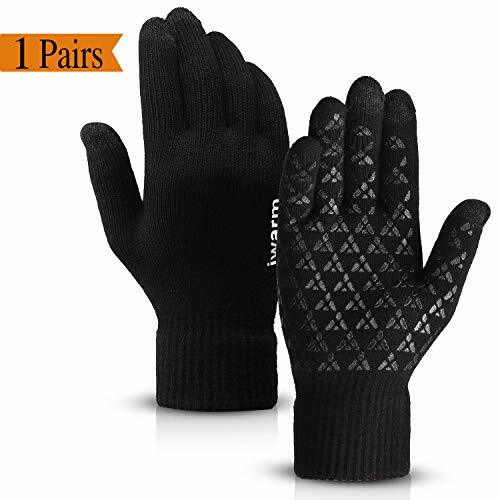 These gloves feel smooth to the touch on the outside and are very fashionable. The winter gloves will make a best gift to your daughter, mom, girlfriends, etc. 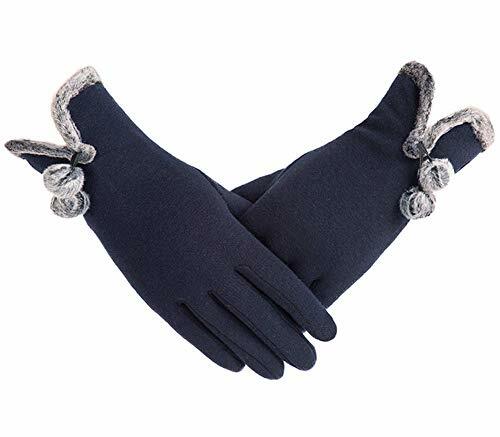 CLASSIC TIMELESS LOOKING COLD WEATHER GLOVES: The winter warm gloves come in 3 colors and all of them are equally lovely and classy-wine gloves,black gloves and grey gloves. You can dress it up or dress it down. Defenitely winter gloves especially for these cold days! One size fits all. These gloves are generously cut in length, are stretchy. You can wear them everyday but they are also perfect for a special occasion. MATERIAL AND SIZE: Our women's touchscreen gloves is high quality, warm and comfy. 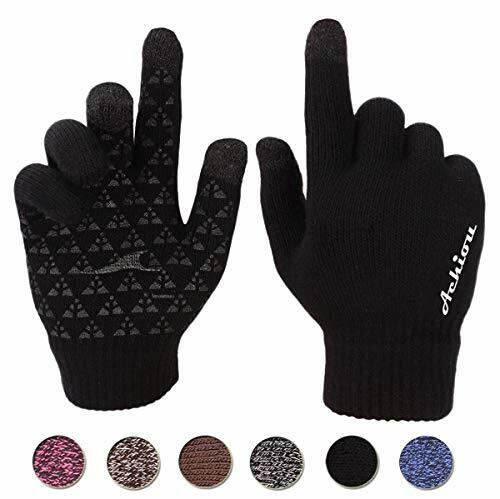 The womens winter gloves is free size which fits most people, it is stretchable, don't worry about the size. 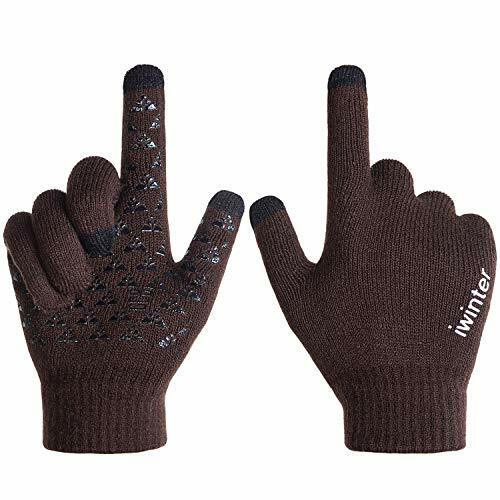 WINTER GLOVES WITH TOUCH SCREEN FINGERS: The touchscreen winter gloves works by 2 fingers (thumb, index). Touch screen mittens with satin inset on the thumb and index finger, making you use the phone, tablet PC freely while keeping hands warm in cold weather, live a smart life. 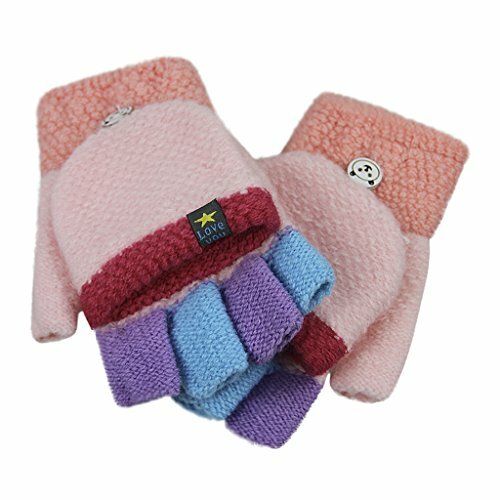 GREAT GIFT: This touchscreen winter gloves come in a wide variety of colors, with button or liffle fur, you can choose any color and style you like or appropriate as the best gift for your daughter, mom or friends. Get ready to give them a special gift and a surprise in holiday or any important days. PRACTICAL DESIGN: Great fleece gloves with touch screen fingertips. 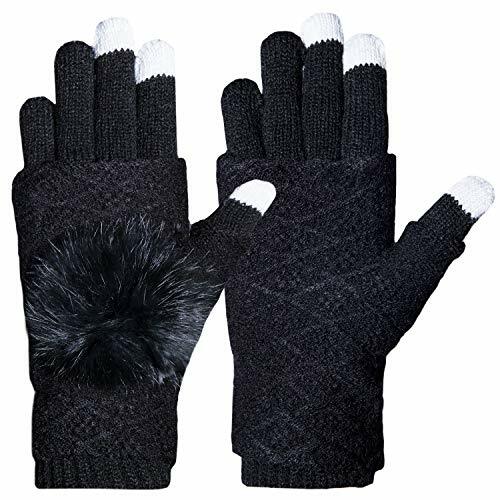 Wear these awesome touch gloves in winter weather to stay warm, and available in so many bright colors, you'll still want to wear them on the cool and breezy days of fall and winter. Perfect for use in the office or studio, indoors or out. Winter essential, skiing, riding, snowball fights and yard work etc. GUARANTEE: Quality guarantee and 5-star customer service. 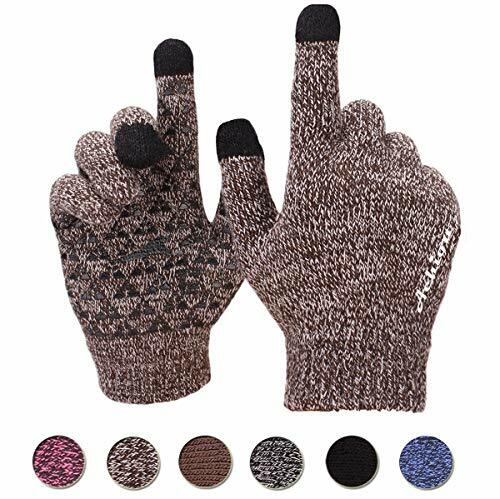 If you are not 100% completely satisfied with your womens winter touch screen phone gloves, simply let us know and we'll serve for you. STAY STYLISH: Shearling like cozy Microsuede texting gloves with warm plush SherpaSoft lining that is stretchy for a contoured fit and supremely soft for the perfect balance of warmth; style and comfort. SIZING TIP AND CARE INSTRUCTIONS: Thick lining creates a snug fit. We suggest sizing up for a more flexible fit. Hand wash cool no bleach. Air dry flat. Do not tumble dry iron or dry clean. GOOD MATERIAL - Our winter gloves are made of 95% acrylic fibres and 5% spandex, and fingers are made of conductive yarns. Comfortable and elastic fabric to keep you warm. Soft, lightweight and versatile enough for any occasion. 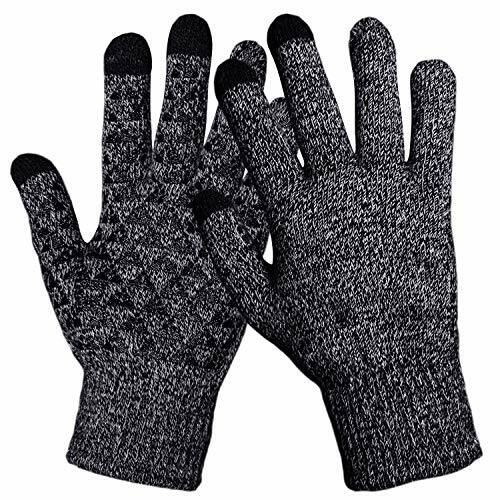 ONE FITS MOST - The overall length of our texting gloves is about 7.87 inches, palm width is about 3.3 inches. One size fits most, very stretchy rabbit hair acrylic blend fits most, don't worry about the size. The touchscreen gloves works by 2 fingers (thumb and index finger). FASHION DESIGN - Various classic colors and stylish design, all go great with casual and formal looks. The simple but upscale touchscreen winter gloves make your hands warm while you're enjoying your time with your favorite touch screen device in cold weather. PERFECT GIFT - Durable materials that you can use over and over again after being washed. No need to worry about deformation or fading. It's recommended to hand wash under cold water and hang dry. Our unisex phone gloves is a perfect gift for your lover, family, friends and so on. Get ready to give them a special gift and a surprise in holiday or any important days. 100% MONEY BACK GUARANTEE - Quality guarantee and 5-star customer service. If you are not 100% completely satisfied with your touchscreen mittens, simply let us know and you will be offered a FULL refund or replacement. Stay active: Soft active Thermaflex dual lining features targeted insulation and flexibility in key areas; active stretch fleece lining provides a custom fit with superior warmth during the winter season. 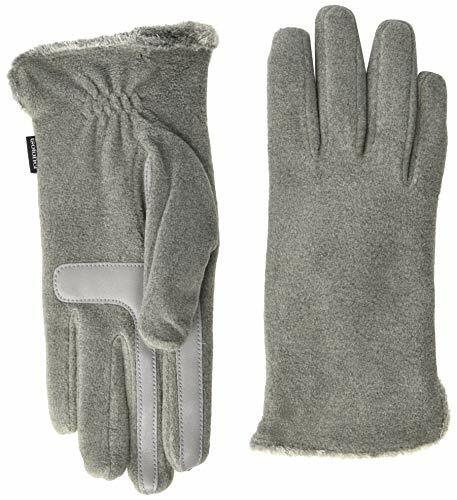 MATERIAL - Our winter touch screen gloves are made of 95% acrylic, 5% spandexr, and fingers are made of conductive yarns, and super soft wool lining. Comfortable and elastic fabric to keep you warm. Soft, lightweight and easy to wear. Hand wash or spot clean recommended! Please try not to machine wash or brush wash (In order to avoid pilling). 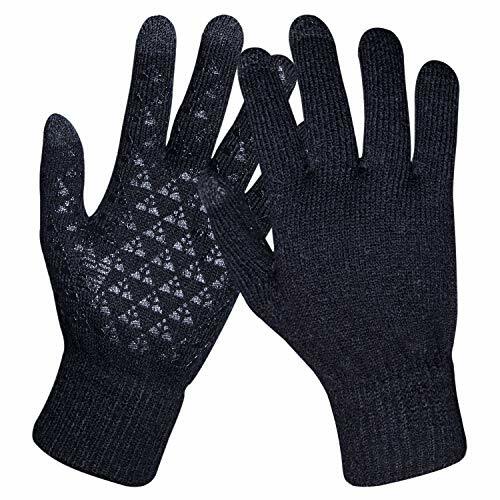 GLOVES SIZE - These knitted gloves are free size which fits most people. It is stretchable, don't worry about the size. Comfortable and high quality gloves material with excellent elasticity, stretches to fit most hands. The touch screen gloves works by 3 fingers (thumb, index,middle ). Touch screen mittens, you can use the phone, tablet PC freely, and let you live a smart life. TOUCHSCREEN FINGERTIPS - Its compatible with electronic devices including iPhone, iPad, Samsung, Android and more. Easy smart phone and tablet use in the cold weather. Smart touch tech enables all screen capabilities including texting! 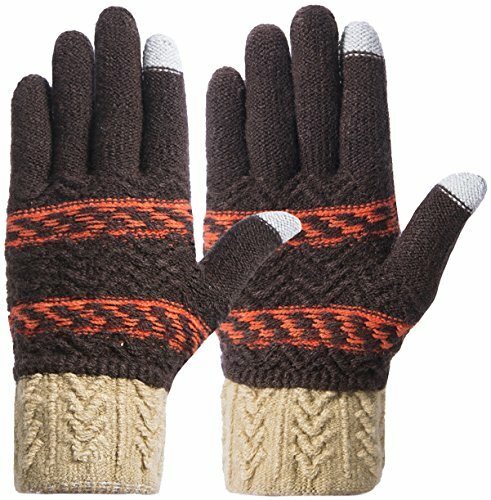 MULTI-APPLICATION - Thick and warm gloves design, a wonderful item for wearing in cold winter while skiing, snowboarding, skating, sledding, snowshoeing, camping, hiking or any outdoor sports and activities. Perfect for use in the office or studio, indoors or out. You can easily get a custom fit according to your hands. Pair off with your favorite Outfit. It's an excellent choice for your friends and family, lover. RISK FREE GUARANTEE - Your purchase is fully protected when you order today. If you are not satisfied with these gloves, contact us any time, we will get you back within 24 hours try our best to make things right! SOFT AND THICK FLEECED LINER: With an inner layer of fleece, your hands will not feel the chill or the wind. 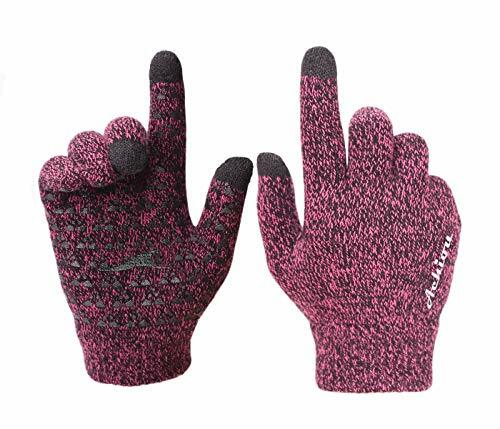 These women touch screen gloves are soft,comfy and warm. But yet, our touch screen gloves are not bulky, allowing you freedom of movement. 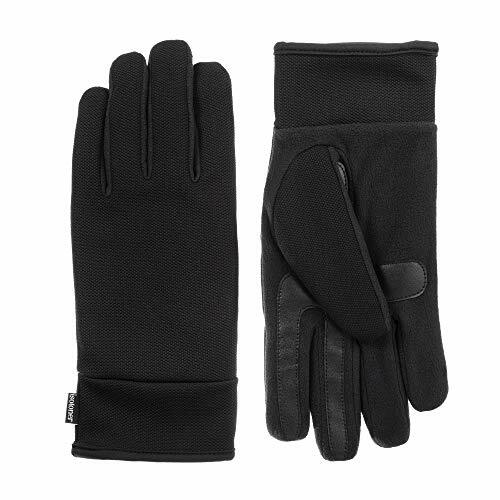 These women gloves are thick enough to keep your hands warm, yet thin to tuck in your coat pocket or purse with no problems. Perfect for the in-between stage of cold weather fall/winter. WOMEN TOUCH SCREEN GLOVES: Equipped with touch screen technology to enable smartphone and tablet use while keeping hands warm in the cold weather. The touch screen parts are on the index fingers of both gloves and also the thumbs. They have a satin inset on the thumb and first finger to allow for use with a cell phone or touch screen device. 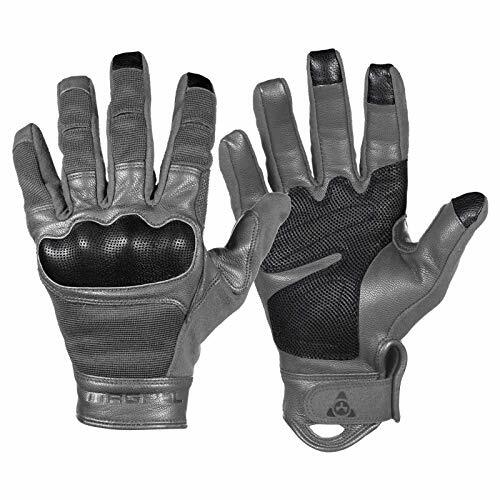 They are very versatile and work well as driving gloves and outdoors on the cellphone. 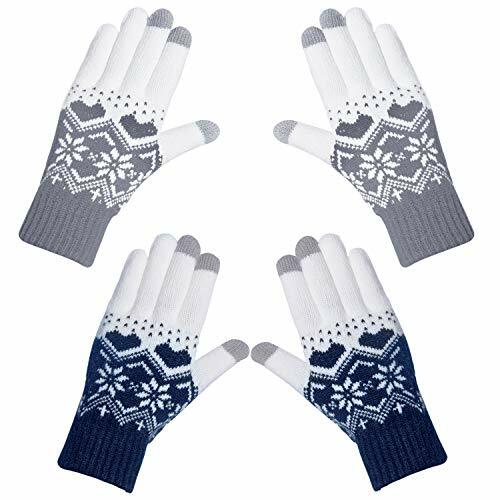 CUTE AND WARM TOUCH SCREEN GLOVES: These are warm lining gloves with elegant appearance. 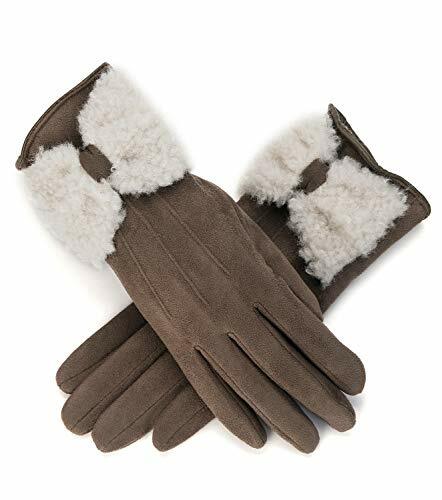 You will love the cute plush fur balls and accenting color on the wrist-gives the classic gloves a feminine touch. Adds great style and convenience with the screen touch to any cool weather outerwear. Our gloves feel smooth to the touch on the outside and are very fashionable. The gloves will make a best gift to your daughter, mom, girlfriends, etc. 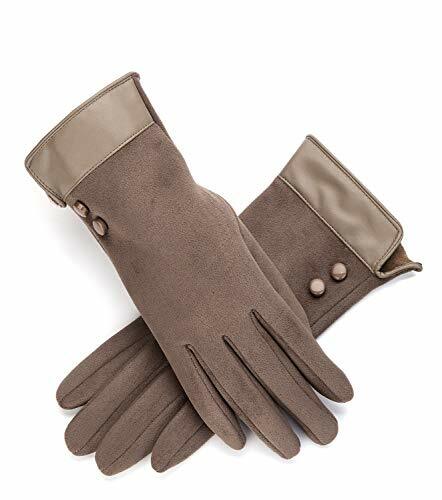 GREAT CLASSIC TIMELESS LOOKING GLOVES: The thick warm gloves come in 3 colors and all of them are equally lovely and classy-burgurndy gloves,black gloves and grey gloves. You can dress it up or dress it down. Defenitely winter gloves especially for these cold days! One size fits all. These gloves are generously cut in length, are stretchy. You can wear them everyday but they are also perfect for a special occasion. OMECHY aim's to the professional company that tending to men & women who seeks Sleek style and High quality products at a reasonable price. We are proud our product quality is high and they can be purchased at a reasonable price makes everybody satisfied. Omechy We do a great design and only high quality of our Products in a professional way. HEAVY DUTY SOFT ACRYLIC MATERIAL - 50% Wool 50% Polyester outer shell & fleece interior & 100% thermal insulation & leather palm. OMECHY convertible fingerless mittens gloves are meaning for warm, soft & comfortable to wear in winter and fall. 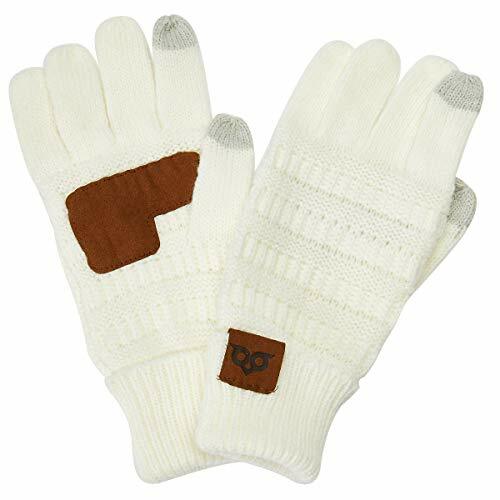 Lined with Genuine High Quality Lining, OMECHY Mens and Womens winter Knitting Wool Glove Mittens are thick and windproof for outdoor activities. 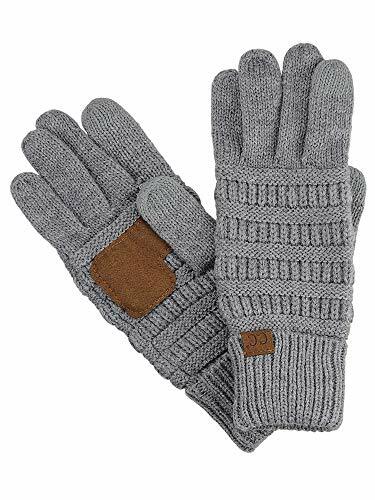 STYLISH & AGILE DESIGN - OMECHY Unisex Mittens gloves with flap mitten cover, allows you to wear these sentry wool knitted gloves in mitten ways and fingerless way. The nice velcro on back of the mittens cover will fix the flap cover and let your fingers texting and use your smartphone. 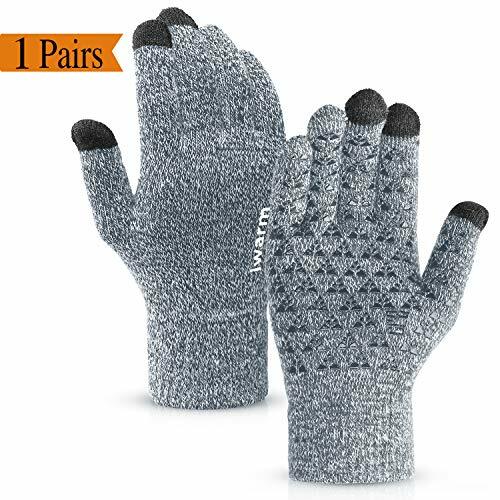 CONVENIENTLY & UNLIMITED USE - OMECHY Winter Warm Knitting Gloves are great to wear on and play touchscreen electronic device like texting/typing/writing, as well as wear for work. Great for skiing, snowboarding, ice skating, snow tubing, snowball fights and all other outdoor activities in winter & fall.